Yesterday I had the opportunity to be consulted by one of the best endocrinologists in the nation and the world. You know how that feels? It feels like a cup of hot chocolate during a blizzard. Or as my friend once put it, “A glass of water tastes good after trying to drink mugs of mud.” It feels something like that. When it comes to having the opportunity to see and be checked out in a leading research hospital, recognized by the National Institutes of Health as one of seven Diabetes Research and Training Centers in the United States, I’ve realized that I’ve come a long way in my diabetes care. If you’ve followed the blog, you’ll know that just last year I didn’t have any insurance whatsoever and now, now I was sitting in front of a scientific expert when it came to something I’ve been living with since I was 7 years old. I was thankful, grateful and thirsty for as much information as I could get my ears on at the moment. For more than 25 years, Dr. Philipson has tirelessly explored the biophysical, molecular and genetic aspects of insulin secretion, and the genetics of diabetes. He and his colleagues discovered rare insulin gene mutations that produce beta cell ER stress and, in turn, cause neonatal diabetes. In addition, Dr. Philipson and his colleagues are among the nation’s leading experts on monogenic diabetes, following more than 100 patients diagnosed with neonatal diabetes and many others with maturity onset diabetes of the young (MODY) type diabetes. He also serves as co-director of the Human Islet Transplantation project at the University of Chicago. I mean, not just a few months ago I had a nurse telling me that I should not check myself so much because I only had one test strip to work with a day! Now I was learning from one of the best. I could have talked to him for hours. 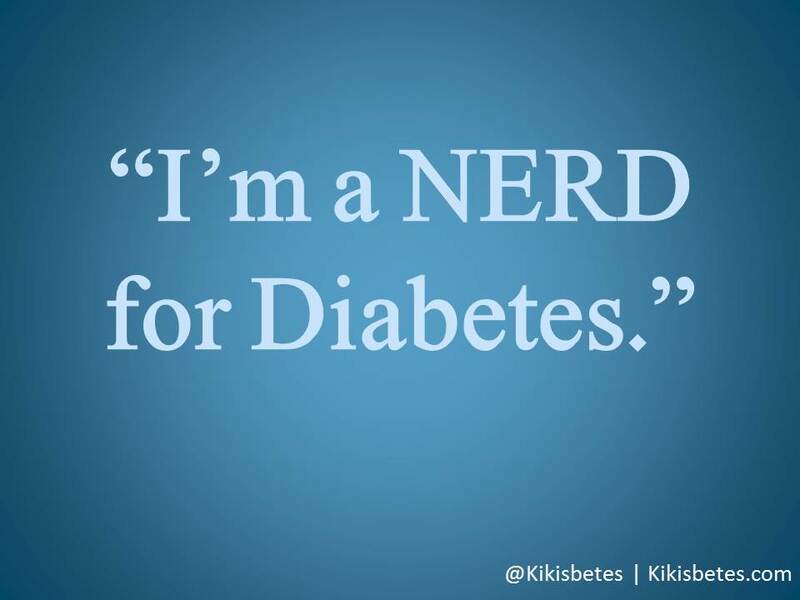 I’m a nerd for Diabetes. I want to know about every aspect of it and write about it. I want to tell the diabetes story and share what I know. The body is miraculous and the reason as for why mine has broken down, or just stopped working is beyond me, but because it affects over 350 million people in the world and not just ME, I want to know what and how and what part I play in a cure. The idea of experiments, trying new things and ultimately sharing findings is exciting to me. And let’s not even begin to talk about technology. If you are a person with diabetes or are close to someone who is, you are quite possibly a tech geek in the space that has increased its following 10-fold over the past few years due to the leaps in technological advancements when it comes to checking blood sugar levels, administering insulin and even gauging all of that information into devices that make it easy for people to analyze. I am NOT a numbers person, but when it comes to seeing all of the information my pump gathers, I freak and flip and try to figure out how to get those numbers down and where they’re supposed to be. Would I like to do that for fun for something else? No. But show me, tell me about diabetes glucose numbers and watch me want to fix it. But it all starts with self management. There was a sign in the examination room that basically stated the questions that people should ask when it came to seeing the doctor. I learned this a long time ago and since then I’ve opened up to my doctors and tell them everything that I know, all that I’ve done and I asked questions. Before seeing Dr. Philipson, I saw Susan, the diabetic educator, and I told her my entire life story. I mentioned all the doctors I’ve seen, (it’s a total of six now) the fact that I blog, volunteer, do a radio show and am actively trying to kill the stigma that exists out there. I explained my lifestyle, the things I’ve tried, what I’m bad at (mostly just checking blood sugar when I have my CGMS in and at using the bolus wizard) along with what I know how to do. I was referred to as an old pro. I just wish I was getting paid for the management that I go through! I told them about twitter chats for DSMA and how I feel when I share the information that I come across and know. It’s important that the doctors know me as much as I know them. And not just the doctors, but the team. We know that diabetes affects every part of your body. We also know that everything we do, down to stress levels, affect our blood sugars and hence the severity of diabetes (whichever type you have). If I can walk in to the doctor and talk about stress levels and learn more in-depth as to how it all affects me, I’m going to be a happy camper and they’re going to understand what I’m going through. In the end, we all search for understanding and acceptance. We, as PWDs, are not by-the-book experiences. You can’t figure us out with a formula. It’s hard for even significant others to understand what you’re going though and surprisingly there are still many of us who don’t know anyone IN PERSON with the type of diabetes we have. We are plagued with thinking like an organ and we won’t be taken down because of such a situation. Hard to get, right? But that’s why, when you find someone who understands and can explain and push you in the right direction and be a cheerleader and tell you how to help yourself WHILE at the same time looking for advancements in how to make your situation less burdensome, it’s almost a miracle. This blog is just one part of the whole. I want to wait for test results from the six tubes of blood they took out of me to get into the nitty, gritty scientific stuff. A lot of what Dr. Philipson told me had to do with other patients, studies and hypothetical situations of various forms of diabetes. It’s also cool that he explained the “Dirt Theory” about Type 1 diabetes in children, that Scandinavia has the highest rate of Type 1 diabetes and that genealogical-ly speaking, you have to consider so much when talking about hereditary diabetes among Latinos because of all the places we come from! I mean, you can’t expect too much. It was only the first appointment! So, stay tuned for the next one friends and thanks for reading.